Brian Joseph Chesky (born August 29, 1981) is an American billionaire Internet entrepreneur who co-founded the peer to peer lodging service Airbnb. Chesky is the CEO of the company and was named one of Time's "100 Most Influential People of 2015". 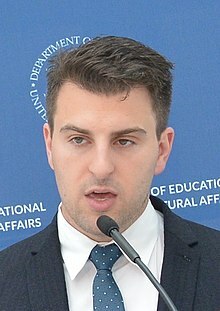 Brian Chesky was born on August 29, 1981, in Niskayuna, New York. He is the son of Deborah and Robert H. Chesky; His father is of Polish descent and his mother is of Italian origin. Chesky's parents were both social workers. He has a younger sister, Allison. As a child, Chesky was interested in art, drawing replicas of paintings, and design, redesigning shoes and toys. He later became interested in landscape architecture and design. In 1999, Chesky started attending the Rhode Island School of Design (RISD). He received his Bachelor of Fine Arts in Industrial Design in 2004. During his time at RISD, Chesky met Joe Gebbia, who would later be one of the co-founders of Airbnb. After college, Chesky worked as an industrial designer and strategist at 3DID, Inc. in Los Angeles. He later moved to San Francisco, where he shared an apartment with Gebbia.[when?] In October 2007, the Industrial Designers Society of America was hosting a conference in San Francisco and all hotel rooms were booked. The pair could not afford rent for the month and decided to rent their apartment for money. They purchased three air mattresses and marketed this idea as "Airbed and Breakfast", with three guests staying the first night. In February 2008, Harvard graduate and technical architect Nathan Blecharczyk became the third co-founder of Airbnb. Each co-founder assumed a role within the new company, with Chesky becoming the leader and chief executive officer. In order to receive funding, Chesky and his co-founders created special-edition cereals called "Obama O’s" and "Cap'n McCains", based on presidential candidates Barack Obama and John McCain. Impressed by the cereal boxes, Y Combinator accepted Airbnb into its seed funding program. In its first year, the company began internationalizing and opened several offices in Europe. In 2011, Chesky wrote a letter on behalf of the company for its handling of a resident complaint about tenant vandalism by announcing a 24-hour hotline, additional staff support and a guarantee for theft or vandalism. In 2015, Chesky announced that Airbnb was an official sponsor of the 2016 Summer Olympics in Rio de Janeiro, Brazil. He said that more than 120,000 people had stayed in Airbnb homes during the 2014 FIFA World Cup. As of March 2015, Airbnb has a $20 billion valuation. In April 2017, he featured as first protagonists of the podcast series by Reid Hoffman (Linkedin co-founder) Masters of Scale, among other business members of success such as Mark Zuckerberg, John Elkann and Diane Green. Here he discussed about the strategy adopted by Airbnb to scale. In 2015, Chesky was recognized on the Forbes list of America's Richest Entrepreneurs Under 40. Chesky was recognized on TIME's 100 Most Influential People for 2015. In May 2015, President Obama named Chesky as an Ambassador of Global Entrepreneurship. He was also named in the Youngest Forbes 400 list in 2016. In 2018, Chesky was named the Bay Area Executive of the Year by Business Times. ^ "#207 Brian Chesky". Forbes. January 19, 2019. ^ "Harry Chesky Obituary". Albany Times Union. October 4, 2008. ^ Stone, Brad (2017-02-02). The Upstarts: How Uber, Airbnb and the Killer Companies of the New Silicon Valley are Changing the World. Transworld. ISBN 9781473527027. ^ Gallagher, Leigh (2015-06-26). "The education of Airbnb's Brian Chesky". Fortune. Retrieved 2018-03-01. ^ Cohen, Anne (April 16, 2015). "Ruth Bader Ginsburg, Amy Schumer and Bibi Make Time 100 List". Forward. Retrieved March 8, 2016. ^ Bryant, Adam (2014-10-11). "Brian Chesky of Airbnb, on Scratching the Itch to Create". The New York Times. ISSN 0362-4331. Retrieved 2018-03-01. ^ Hartmans, Avery (2017-07-22). "The fabulous life of Airbnb's Brian Chesky, one of the youngest and richest tech founders in America". Business Insider. Retrieved 2018-03-01. ^ a b Bryant, Adam (11 October 2014). "Brian Chesky of Airbnb, on Scratching the Itch to Create". The New York Times. Retrieved 23 February 2016. ^ Carr, Austin (17 March 2014). "Inside Airbnb's Grand Hotel Plans". Fast Company. Retrieved 23 February 2016. ^ Geron, Tomio (11 February 2013). "Airbnb And The Unstoppable Rise Of The Share Economy". Forbes. Retrieved 23 February 2016. ^ Friedman, Thomas L. (20 July 2013). "Welcome to the 'Sharing Economy'". The New York Times. Retrieved 23 February 2016. ^ Brown Ekiel, Erika. "The Entrepreneur QuestionnaireL Brian Chesky, Co-Founderv and CEO of Airbnb". Archived from the original on 17 October 2013. Retrieved 17 October 2013. ^ Helm, Burt (December 2014). "Airbnb Is Inc.'s 2014 Company of the Year". Inc. Retrieved 23 February 2016. ^ "Best Young Tech Entrepreneurs". Bloomberg Business Week. ^ "Brian Chesky: Handcrafted". Masters of Scale. ^ Fairweather, Alistair. "Brian Chesky: The homeless entrepreneur". Mail & Guardian. Retrieved 21 October 2013. ^ Bradshaw, Tim. "Airbnb Moves "Aggressively" into Europe". Retrieved 17 October 2013. ^ "Sleazy Airbnb Is 'Very Sorry' For Wrecking Your Apartment". Gawker Magazine. Archived from the original on 25 July 2014. Retrieved 18 July 2014. ^ Kashdan, Jason (22 April 2015). "Airbnb CEO on global expansion and legal pushback". CBS News. Retrieved 8 March 2016. ^ Jason, Klampet. "Airbnb's New $1 Billion Funding Would Value It At $20 Billion". skift.com. Skift. Retrieved 26 March 2015. ^ "Master of scale - Brian Chesky". ^ "Brian Chesky - The Giving Pledge". givingpledge.org. Retrieved 2017-12-16. ^ "40 Under 40". Forbes. Retrieved 23 February 2016. ^ Ive, Jonathan (16 April 2015). "TIME 100 Pioneers: Brian Chesky". TIME. Retrieved 23 February 2016. ^ Brayton, Jenna (11 May 2015). "The White House Celebrates Entrepreneurs Around the World". The White House Blog. Retrieved 23 February 2016. ^ Vinton, Kate. "Brian Chesky - pg.9". Forbes. Retrieved 2017-05-23. ^ "Brian Chesky grew Airbnb from three airbeds in a living room to the biggest force in hospitality. He's the 2018 Executive of the Year (Video)". www.bizjournals.com. Retrieved 2019-03-06.